"There is a citizen of Winnipeg whose name is known to only a few outside literary circles, yet his fame will live long after our captains of industry, the grain nabobs, members of parliament and the city council, to say noting of other saints, scholars and sinners will have passed on unwept, unhonoured and unsung. I refer to Cecil Francis Lloyd, essayist and poet." While researching sites for my Victor Street walking tour I came across this sad looking, boarded up little cottage and was intrigued to find out what stories it had to tell before it is torn down. I found that one of the residents of the home was considered by some to be one of Western Canada's great up-and-coming poets and essayists until he tragically took his own life there during the Depression. This 800 square foot house with no basement was built in 1905. Initially, it was home to a number of men who worked on loading docks until 1907, when teamster John Evans, owned it for a few years. Jump ahead to 1922 and it became home to Cecil Frances Lloyd and wife, Maud. Alex Musgrove, the Winnipeg Tribune's literary reviewer wrote of Lloyd's background in one of his column under the nom de plume, "Ivanhoe". He noted that Lloyd was born into a wealthy family in Malvern, England, and that, "He spent his youth in a literary coterie of wealth and culture.... He and his mother traveled extensively throughout Europe and halcyon were the days which promised to stretch into a long futurity. But his mother died; adversity came; he sought a living in a new land." It appears that Lloyd spent his first years in the province outside of Winnipeg. He married Maud Robinson in Gladstone in 1913. In 1918, the couple can be found living at 333 Edmonton Street, a comfortable rooming house geared at business people, in Winnipeg. They bought this little home on Victor Street in 1923. Lloyd's day job was working as a bill collector for Stanwood's, an odd combination of millinery shop and music store. He wrote poetry and essays on the side which he submitted to magazines and journals for publication. 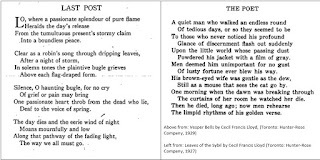 One of the first mentions of a published piece was the four page poem, How the Canadians Came to Fresnoy in the April 1919 edition of University Magazine, a quarterly co-publication of McGill, University of Toronto and Dalhousie. Sadly, Maud died at the home after a lingering illness in May 1926 at the age of 35. The couple had no children. The death devastated Lloyd and it became a recurring theme in his writing. When not working at Stanwoods, Lloyd became a recluse inside the house with his dog and cats for company. His writing was his escape. "Ivanhoe" later recalled that Lloyd approached him soon after Maud's death with a manuscript for a novel and some poems and essays to critique. He felt the novel had a number of "structural" problems but found Lloyd's poetry and essays "decidedly worthwhile" and encouraged him to pursue this facet of his writing. Lloyd followed Ivanhoe's advice and in 1927 had a number of works published in magazines such as Saturday Night and The Canadian Bookman. 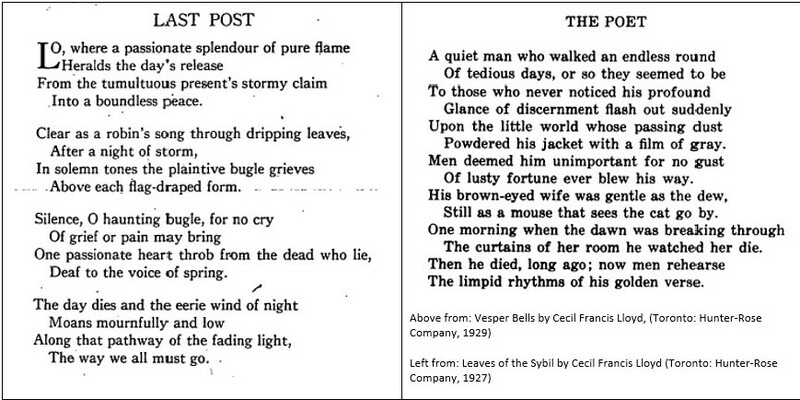 Lloyd also released his first collection of poems in 1927. Leaves of the Sybil was self-published through Hunter Rose Co. of Toronto. Ivanhoe's review for the Winnipeg Tribune concluded, "(Lloyd) has no small talent and is more original in thought than most singers in the Canadian choir." Another self-published book followed in 1928, Sunlight and Shadow, also through Hunter Rose Co., in which Lloyd explored a "return to nature", a popular literary theme at the time. In 1929, Lloyd self-published two more works through Stovel Co. of Winnipeg: Rosemary and rue and Vesper Bells. By the end of the decade, Lloyd was becoming a familiar name on the national poetry scene and Ryerson Press of Toronto published his next book, Malvern Essays, in 1930. In The Manitoban literary review supplement in the Winnipeg Tribune of 1930, "KMS" wrote of Malvern Essays, "His essays are short, pithy and frequently give one to think exceedingly", noting that Lloyd writes "simply and naturally as if he were writing to a friend." The review concluded with a passage from the essay Clouds: "Take your noses out of the newspapers and away from the latest vulgar murder for a minute, my dears, and look at the sky. You will grow happier and perhaps even a little bit wiser." 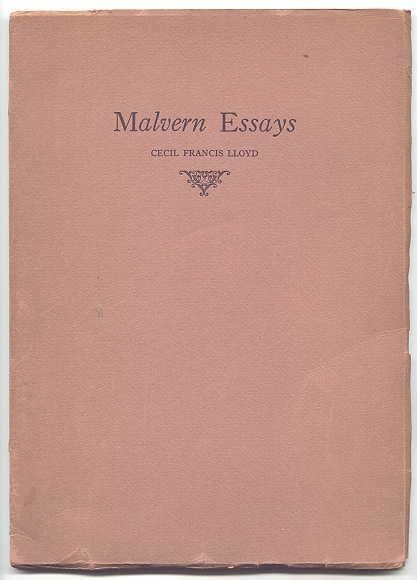 The Literary History of Canada includes a reference to Malvern Essays and says of Lloyd: "...he derives a mild and checkered enjoyment from being alive. His attitude is ambivalent, recognizing as it does the permanent and the fleeting, the beautiful and the homely, life and death.... Lloyd's style has individual faults, but in general it is easy and graceful and faithfully portrays a sensitive, rather sad personality." Despite the publication of Malvern Essays Lloyd struggled during the Depression. Lloyd lost his job around 1932 and could not find another one. He tried to live on his writing alone, which was nearly impossible as publishers scaled back their operations and the few appearances in journals and magazines paid a pittance. Living in poverty, and eventually on city relief, Lloyd could not afford to self publish. Ivanhoe wrote of Lloyd in 1935: "He is an eremite. He lives all by himself on a little house on the edge of the city and loves loneliness." Lloyd got a lifeline in April 1935 when Ryerson Press agreed to publish Landfall: The collected poems of Cecil Francis Lloyd for the fall season. The news even coaxed the recluse from his home to attend the annual meeting of the Winnipeg branch of the Canadian Authors' Association that May. Landfall was dedicated: "To the memory of my wife. A loyal comrade in many a hard-fought battle and a gay companion in many a wild adventure of the spirit." On the strength of his work, Lloyd was chosen as one of thirty-eight poets included in the inaugural edition of The Canadian Poetry Magazine published by the Canadian Authors' Association in January 1936. In the 'new books' section of a 1936 edition of the Dalhousie Review, writer Watson Kirkconnell wrote of the collection: "Twenty-five sonnets and thirty-eight brief lyrics may seem a slender foundation on which to base a poetic reputation, but when some of them are the finest ever written in Canada, the authenticity of Mr. Lloyd’s high poetic rank seems indisputable. Should he write nothing further, his place in the front rank of our lyric poets will remain secure." Like Musgrove, Kirkconnell was a member of the literary establishment that supported Lloyd's work. When Kirckconnell was a professor at Wesley College from 1922 to 1940 the two struck up a friendship, communicating mostly by letter. Lloyd's final letter to Kirkconnell was dated July 12, 1938, not long after the author received notice that his tiny Victor Street house was to be foreclosed on by the bank. The professor was on an extended stay in Hungary and would not get to read it for another two months. It read, in part: "I have lost home, books, pets, everything that makes life worth living and I am not going to stay to become a nuisance to my friends and sink as I have seen many sink. The hardest thing I shall have to do tomorrow morning will be to kill my poor pussies to save them falling into the hands of some brute who would abuse and neglect them... I shall be nearly dead before I turn the gun on myself. Now an eternal goodbye, my very good and true friend and may whatever gods there be bless you and Mrs. K and the children." On July 13, 1938, Cecil Francis Lloyd took his own life. He was 55 years old. Upon news of his death the Winnipeg Free Press wrote, "Lloyd's writings are certainly his monument. He made a vital, if small, contribution to Canadian Literature." Writer and journalist Wilfrid Eggleston, who knew Lloyd only by his writing, called his death "one of the most poignant incidents in Canadian literary history" in a 1969 column. Kirkconnell seemed haunted by the death of the man he referred to as his "tragic friend". 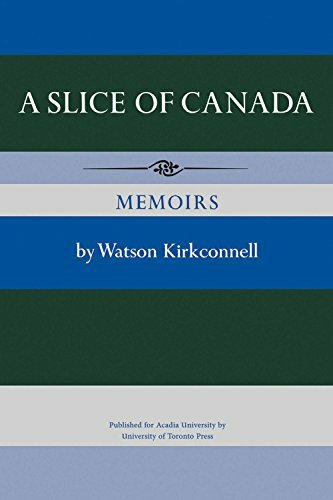 His 1967 memoir A Slice of Canada included mention of Lloyd's death and passages from the final letter Lloyd wrote to him the day before he died. 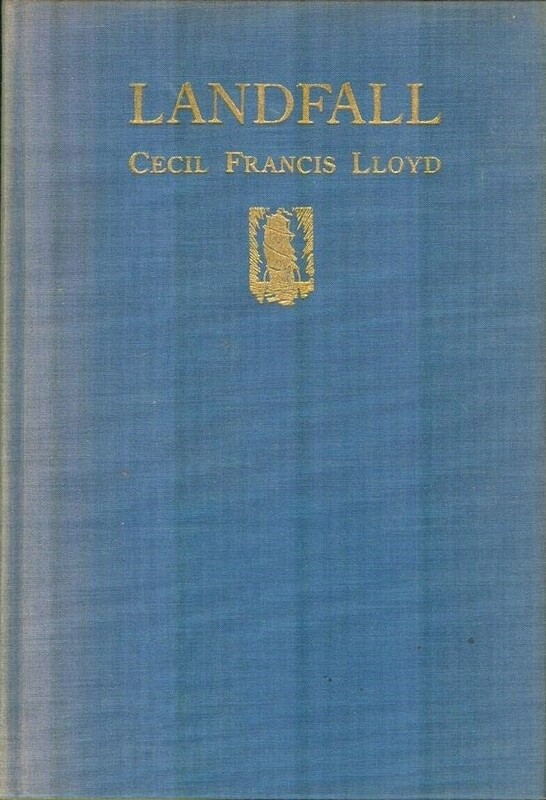 In 1974, Kirkconnell went one step further and produced 60-page tribute book to Lloyd called Rest, Perturbed Spirit: Being the Life of Cecil Francis Lloyd, 1884-1938, (Lancelot Press, 1974). It included a selection of Lloyd's poems, essays and letters sent to Kirkconnell along with "an affectionate critique." What was a blossoming career as a writer of national significance was cut short and today Lloyd is barely a footnote in a handful of anthologies. The house where he wrote, struggled and died will soon be gone, too. Very interesting. I live down the street from this house. Has a sad vibe to it. Thanks for the thorough research. Keep up the good work!